Bored with boneless pork chops? Give our Barbecued Pork Chops a try! Made with a simple marinade and grilled to perfection, these barbecued pork chops are sure to please. Mix all ingredients except chops. Pour 1/2 cup over chops in shallow dish; turn to evenly coat chops. Refrigerate 1 hour. Heat barbecue to medium heat. Remove chops from dish; discard marinade. Grill chops 12 to 15 min. or until done (160ºF), turning after 8 min. and brushing with remaining sauce for the last 2 min. Do not be tempted to open the lid of the barbecue to check on the meat every couple of minutes. Every time you open the lid, heat escapes, which means it will take longer to get those pork chops on your table. 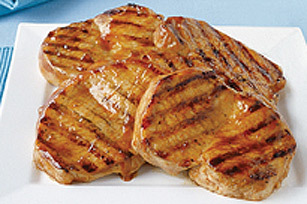 Chops can be marinated up to 24 hours before grilling as directed.